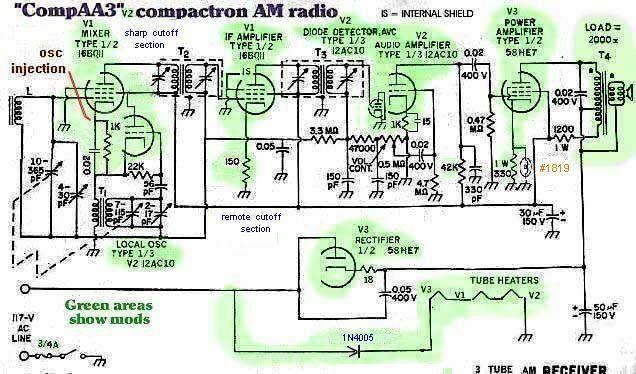 This is the classic AA5 AM tube radio modified to use three Compactron tubes. 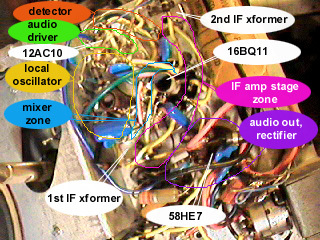 The diagram below shows the modifications (in green) done to an otherwise standard AA5 AM radio circuit. 8B10 twin triode - twin diode, local oscillator, first audio amp, and detector/AVC diode. Second diode grounded. 38HK7 pentode diode, audio output amp and power rectifier. The front end mixer has the local oscillator signal injected into the mixer's cathode from the local oscillator cathode via a 100 ohm resistor. The resistor creates a DC bias point for the mixer and delivers the oscillator waveform to the mixer cathode. This provides more gain than the old 1K in parallel with a cap circuit I had here before. This causes the difference between the mixer's control grid and its cathode to be modulated by the local oscillator. This action causes heterodyning, yielding the intermediate frequency of 455KHz. Try a lower value of resistance for this resistor to see if you can have more conversion gain without instabilities. The local oscillator uses a triode section of the 8B10. The mu (18) of this tube is similar to the mu (20) of the oscillator portion of a 12BE6 (cathode, g1 and g2 (which corresponds to the plate of the 8B10)). No mods to the oscillator coil or cap are needed. Be sure to keep these wires away from the mixer and IF stage tube circuits. I was getting all sorts of junk before I noticed this. Be careful with the lead dress of the antenna lead to the mixer pentode, avoid being near the mixer's output lead. Being too close can cause instabilities like oscillations. Also: be sure to do a re-alignment of the RF and IF strip, as the new tubes place differing capacitance loading on these tuned circuits. This helped the above mentioned instabilities, as a narrower aligned IF lets less signal to leak back into the antenna. Also try different values of cathode resistor in the IF amp portion of the 11AR11, to get max gain without going unstable. And back off a little so things don't drift unstable later. A 250 ohm trimpot in series with a 47 ohm resistor is an easy way to do this. One method to check/adjust the IF stage gain is to temporarily short out the local oscillator LC circuit, and adjust the cathode resistor so no oscillations are heard. This disables the heterodyning of signals to the IF, thus yielding no signal and thus the AVC sets the mixer stage and IF for max gain. If it is stable like this, it should be stable receiving weak and strong radio stations. But check anyway. Shielding the 11AR11 should help. Be sure to use a tube socket that has shielding in the center of the circle of pins. I used some copper sticky foil to line the center hole (be sure you don't mechanically interfere with the tube's tip seal) of a socket I used that had no shielding. Ground this shield. Made quite a difference. I put some shielding sheet metal around this tube and connected this shield to ground, but this was less significant. This solderable metal is the sort used for shielding tuners and other similar circuits. Approx 2.4cm tall, and 11cm long would be about the right size. Make a loose cylinder shape, with about 1 mm spacing around the tube. Small holes in the shield are okay, and help ventilate the tube. Position the shield vertically to cover the plates inside the tube. Use stiff wire to mechanically position the shield, and to ground it. The position of the loop antenna in relationship to the radio chassis or circuit board may also make a difference. I found things can get more or less stable depending on the antenna positioning. Test things in their final positions before you finish. 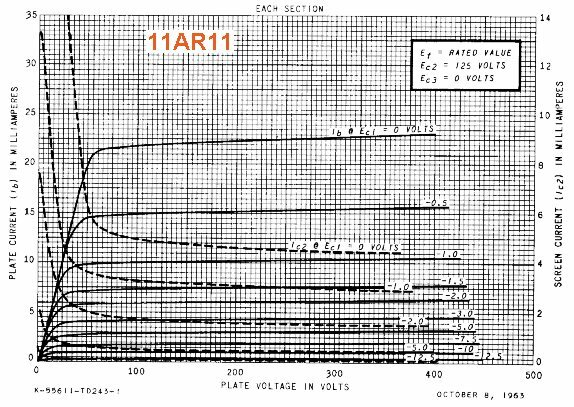 A comparison of the remote cutoff curves of the 11AR11 and the 12BA6. I'm using one of the diodes of the 8B10 as a detector. 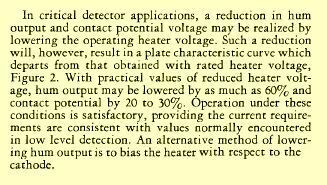 I found that audio fidelity of detected weak radio stations can be improved by using reduced heater voltage. This lowers "contact potential" on the diode, which comes from stray electrons floating around the hot cathode. Less of this means that a weak signal doesn't have to overcome as much of this potential to be detected linearily. I used a 100 ohm 1 watt resistor across the heater to drop the heater voltage from 8.5V to about 7.7V. This resistor divertes some of the series string current from the tube heater, thus lowering the voltage and thus the heat on the diode cathodes (and also the triode cathodes too, but the circuits they are in didn't suffer). This is just like the reduced heater voltage on detector diodes like the 6H6, 6AL5 or 5896 to improve detector performance on weak signals. Less "contact potential" for the signal to overcome. This should increase the fidelity of AM detection. The 5896 below is a dual diode version. I first tried this stage with the cathode grounded, but the sound quality was a bit poor. A significant improvement was had by biasing the cathode by using a 1K resistor bypassed by a 15uF cap from ground to the cathode. The cathode finds itself at about 1.4V. Which makes the control grid happy. 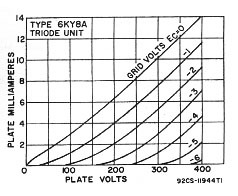 Plate voltage is about 50V, not unusual in AA5 radios. The gain of this stage is lower with the 8B10 than with the old 12AV6, as the mu of the 8B10 is lower. As the plate resistance of the 8B10 is 9.7K vs 80K for the 12AV6, I paralleled a 47K resistor with the 470K resistor that is inside the "AUDET" resistor/capacitor module. This yields about 2 dB more audio gain than that before adding the 47K resistor. This triode's plate circuit now has less impedance than before, and its output doesn't drop nearly as much with the 470K output grid circuit as when the plate impedance was 470K. I tried to get some gain "back" by bypassing the 38HK7 output section cathode to ground with a capacitor, but got excessive distortion. Conversely, using no bypass cap allows the tube to make use of cathode follower feedback to reduce distortion. 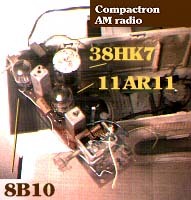 pinouts of the 11AR11, 8B10 and 38HK7. As this tube was intended to be a horizontal deflection output, it doesn't expect to be able to continuously pass 450 ma at 50 v plate current, as this would exceed the plate dissipation. For class A operation as an audio amp, the zero audio signal quiescent plate current and voltage needs to run the tube below the max plate dissipation, here of 10 watts. 130v at 60 ma is about 7.8 watts dissipation. The tube's plate will be operating into an output transformer that in turn drives a speaker. Looking at page 29 in the manual, chapter on electron tube applications, a quiescent zero signal operating point is selected (this is for a triode, though). For the 38HK7 pentode, the info above points to a selection of a quiescent point at 130v at 60ma. The 130v choice is driven by what value the rectifier yields directly off the 120VAC powerline. Output tubes' max plate voltage ratings are actually half of what the tube can actually take before arcing over. This allows a tube to be used in a Class A amp at its max rated voltage (B+) and allow enough headroom for the AC envelope of the signal to ride on top of the B+. Don't try this with semiconductors, however! I started my loadline to start a bit less than twice 130v, and chose 250V at no current. From this point on, the tube's plate is the major player. Also the selection of output transformers I had helps drive load resistance choices :-). Anyway, I drew a crude family of curves (see diagram below) and marked a point at twice the quiescent current, and at where this twice current value meets a knee of some unspecified curve at some unspecified control grid voltage. It probably won't be the 0V bias curve, as this point will, as mentioned before, will put us over the max power curve. Audio tubes are designed for the 0V bias rule, horizontal output tubes (being essentially switches) aren't. I assumed that the 38HK7 is a "sharp cutoff pentode", as some other tubes were designed for deflection and/or audio amp service, and those would need to be sharp. The curve came close to be parallel to the tangent to the plate dissipation curve (blue line in diagram) near the quiescent point. Being tangent means the quiescent is on or just below the max power dissipation curve, and the line doesn't cross over this curve elsewhere. Doing the (diff of volts)/(diff of current) = approx. 2000 ohms for the load. Which is somewhat close to the (gasp!) power transformer (120v to 12. 6vCT @ 1A) impedance the primary makes a 3.2 ohm speaker connected to a 6. 3 v segment of the secondary look like. Turns ratio of about 19 to 1, and impedance ratio is turns ratio squared, here 192 = 361, and 361 * 3.2 = 1155 ohms. This will mean that the zero plate current peak voltage will be lower than the 250V we started out with. Also the 1200 ohm loadline won't cross over the max dissipation line as the quiescent point was selected a little low. 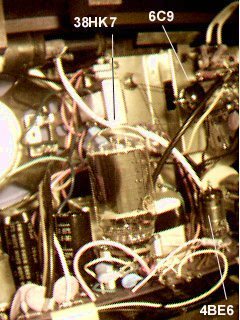 The tube manual didn't explain how this load line could exceed the power supply B+ voltage for currents less than quiescent, but the back EMF from the inductance of the output transformer would create this extra voltage for short periods of time. Time lengths equivalent to the cycle time of the audio waveform. The book says this method is for inductors or transformers with low DC resistance. Which means low quiescent DC voltage drop thru the transformer. This ain't gonna be Hi-Fi, this is an AM radio with a frequency response of 5KHz. This seems a better choice than the pentode plate load method described on page 32, as this (red) line would take you beyond the max plate dissipation (blue) curve. This load roughly complies with Mr C.M. 's rule of thumb at the load resistance should be less than around 1/6th of the plate resistance of the tube. Which seems sensible, in that the Norton equivalent circuit of a tube's plate is a current source (with a negative value, for some weird reason current flow was chosen centuries ago to be in the opposite direction that the actual electrons actually go) with the load resistance in parallel with the plate resistance. Here, the load resistance gets the lion's share of the current. Which makes for better efficiency. But get the load resistance too small, and the "r" portion of P = i2 r makes the power shrink down. The above load resistance is not real far from what this "rule of thumb" yields: From the tube manual, from Class A Characteristics (not max values), get plate voltage and plate current. Approx. load resistance = Pv/Pi, = 130v/60ma = 2100 ohms. Will work, but so will the 1200 ohm load used. A wide range of load values for pentodes will work, so there is no critical spot that has to be zeroed in on. 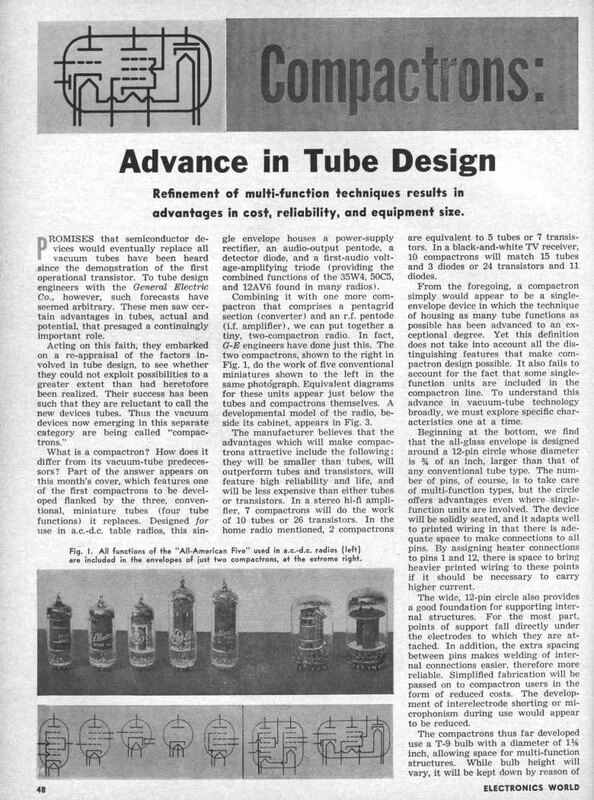 More discussion on choosing loadlines for tubes can be seen here (Steve's). Look for "Loadlines" under "technical reports" in the table near teh top of this page. 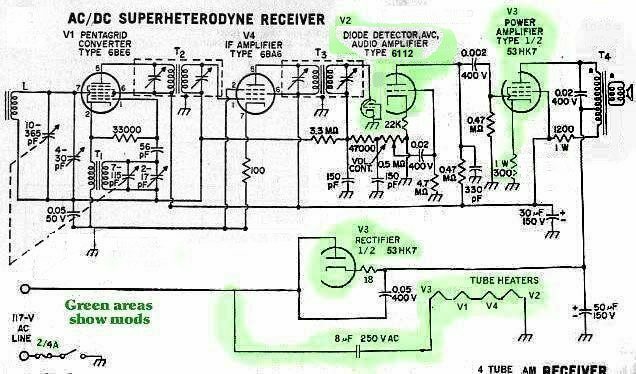 The radio's original output transformer (2500 ohms impedance) had a tapped primary that was used to help "buck" some residual hum by feeding it backwards into the rest of the radio on its low level signal B+ line. I had a section of the centertapped secondary avaliable, so I phased things to match the original scheme. This meant that the speaker voice coil would be at B+ voltage potential, but the speaker is housed in the same cabinet with the rest of the radio, where the user can't access it. In which case, it doesn't matter. Data sheets (PDFs) for 38HK7, 6AR11 (same as 11AR11 except the heater), and 6B10 (again, only difference from the 8B10 is the heater). Main source, Frank's web page, for these sheets. Be aware that there is a daily limit of the volume of downloads from that site. Something like 4 megs. Now that we have the curves for the 38HK7, we can check on the above work that I did before I had the curves. 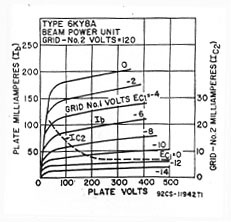 Note that the diagram of the plate current vs control grid voltage is based on the screen grid held constant at 130V. But my radio had it about 105V. 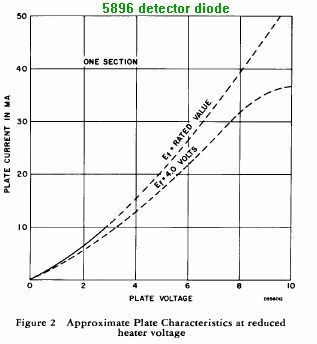 As seen in the diagram of plate current vs screen voltage based on constant control grid voltage, this screen grid reduction yields a reduction of plate current by 75%. 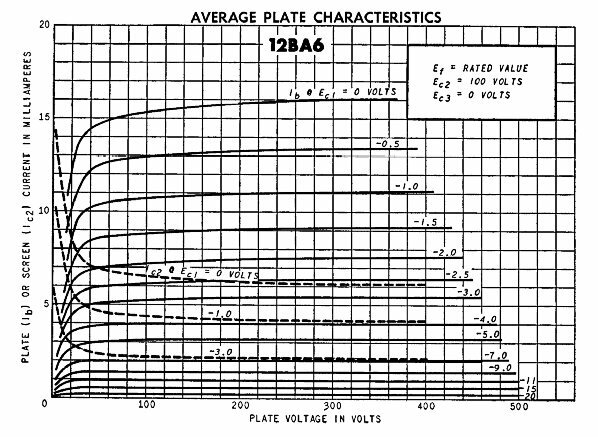 As I observed about 68ma of plate current at quiescent, with the cathode at 17.7V more positive than the control grid in the radio, this matches the above diagrams once the 75% reduction is applied to the plate current numbers on the left side of the plate current vs control grid voltage diagram. If uncorrected, it would look like -22V would be needed on the control grid to get us 68ma plate current. This reduction of current due to the lower than the listed screen voltage can also be seen in this nomograph from the RCA Tube Manual. Here I normalized the 130V screen voltage to "3" on the "Epub" line and the 105V desired to 3*(105/130)=2.42 on "Edes" line. This yields the 75% value of current on the "Fi" line. OTHER COMPACTRON TUBES COULD BE USED. An 11BQ11 could be used for the front end and IF stages. So could a 16BQ11 if the series heater string is to be 315ma instead of 450ma. For the local oscillator, detector and first audio, one could use a 8AC10 or 12AC10 (different pinout). The higher mu of this tube will work fine for the oscillator and first audio. For the detector, ground the cathode and plate, and feed the IF signal into the grid of one of the triodes. 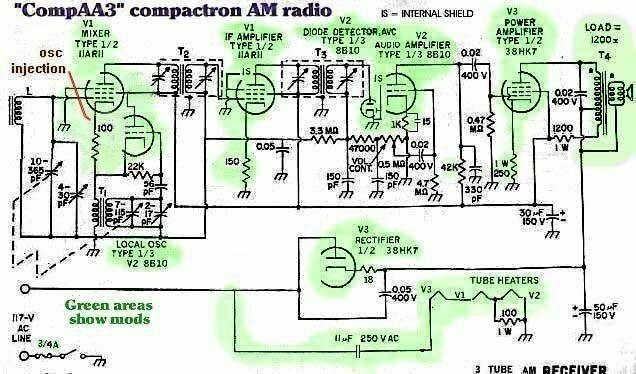 See the combo compactron/ submini radio at the bottom of this page for an example of this. For the audio output and rectifier sections, a 53HK7 could be used in a 315ma heater string. Resize the capacitor of the heater circuit. There's also the 33HE7 and 38HE7 compactrons (450ma). Slightly lower power tubes (different pinouts) like the 33GT7 and 33GY7 (450ma) and 32HQ7 (315ma) should also work. And there's the 50GY7 and 58HE7 (300ma). A lot depends on what tubes you can find. Above I did an RCA 8X541 AA5 with compactrons, using 16BQ11, 12AC10 and 58HE7. The 'HE7 is the same as the 'HK7 except the 'HE7's diode can take a higher PIV. The picture on the right shows the arrangement layout of the various circuits. The layout is important to avoid undesired oscillations. According to some Spice simulations I did, this radio can deliver about 1. 5 watts of audio output, vs 1 watt for a regular AA5. Nearly the same circuit as the top above compactron set, except no heater capacitor was used. As the heater string added up to 86V, one can use a silicon diode to cut the power in half. Remember that power is Volts squared divided by resistance, and 862 = (1212)/2. No filtering on the diode. This diode is separate from the B+ rectifier. I used the positive peaks of the powerline, as cathodes are less likely to pick up leakage from heaters if positive voltage is used on the heaters. Another variation on the above circuit is to use an old transformer that was the vertical output of a tube TV set in substitute for the audio output transformer. The one I used has a turns ratio of 14 to 1. Using a 3.2 ohm speaker, that yields about 620 ohms impedance on the plate of the output tube. Also used a lower resistance in the cathode. Did that by changing the pilot light to a #57. This places the cathode current around 150ma. This yields about twice the audio output power. Usually, vertical output transformers are really autoformers, as the primary and secondary are connected to B+. This means that the speaker voice coil will be riding on the B+, but this shouldn't be an issue in a hot chassis radio without negative feedback. Here I re-did the detector and AVC circuit using a forth tube, a 5896 sub-mini twin diode and reusing the triode that had been the detector diode. This allowed me to remove all the larger capacitors from the audio detector diode circuit, as those caps will cause some clipping of the deep valleys of the AM carrier modulation waveform. Those caps are the AVC filter and also the first audio input coupling cap. The AVC circuit has its own diode, and gets its signal off the IF stage plate circuit. The newly freed triode is now used as a cathode follower buffer to isolate the detector from the coupling cap. This cathode follower will want a negative supply so it can handle large detected signals without clipping. However one can connect the audio detector diode's cathode and the 330K load resistor to a bias voltage to lift the cathode follower's grid so the cathode follower will function correctly into a resistor to ground. This bias voltage is created with a voltage divider off B+ and bypassed RF and audio to ground. Running the detector diode tube's heater at reduced voltage really makes a difference on weak signals. Less "contact potential" builds up on a cooler cathode, and thus doesn't block weak signals like it would at full heat. This is required, or else the above detector mod won't accomplish much without it. It won't hurt the tube, as we are only passing very small currents thru it. In a series string, to cut heater power, I paralleled a 33 ohm resistor on the detector tube heater. This still allows a reasonable amount of negative voltage peaks to feed the cathode follower negative supply above. This reduced heater trick seems to also work well on 12SQ7's and 12AV6's. Only thing is to keep in mind that if you reduce the contact potential for the diodes, it also drops for the triode. But it seems that running the heater at 10V vs 12.6 seems to be a sweet spot. Parallel a 330 ohm half watt resistor with the heater in a series string set. If it's a 6SQ7 in a 300ma heater string, use 160 ohms if you have it, or use 150 ohms. Ö(Lv2 - Hv2) = Cv. Cv will be the AC voltage across the capacitor, in this case, 107V. As the same current "Ih" will flow thru the tube heaters as thru the capacitor, one can figure the reactance "Zc" needed for the cap. The reactance is ohm's law: Cv/Ih = Zc. In the radio above, 236 ohms of reactance. And then use the equation Zc = 1/(2 p fC), or C = 1/(2 p fZc) where C is the cap value in farads, f is the powerline frequency, and p =3.14159... This yielded about 11uF (you'll probably need to wire a few caps in parallel to get the value you need). Use an AC voltmeter and your experience with tubes to verify that you are really getting the right voltage across the tube heater string. You may want to use a fuse to protect the tubes if the cap should ever short out and puts full powerline voltage on the heater string. A fuse of around twice the normal heater current should be a good choice. Just size it to be more than normal (for warmup current), but much less than the current the heaters would draw in the shorted cap condition. Ohm's law should approximate this. Incidentally, the vector angle above shows how much the heater current is phase shifted from that of a purely resistive load. The voltage across the heater string leads the powerline voltage in phase, in this case, by about 60o. A simple MS-DOS program HV.EXE can be downloaded to do this calculation. Or an Excel spreadsheet can be downloaded. For the lowest hum pickup from the heater string, connect the portion of the 8B10 heater that serves the diode cathode closest to ground. The other end of the heater string should be the damper diode rectifier cathode heater section of the 38HK7. See the pinouts above. 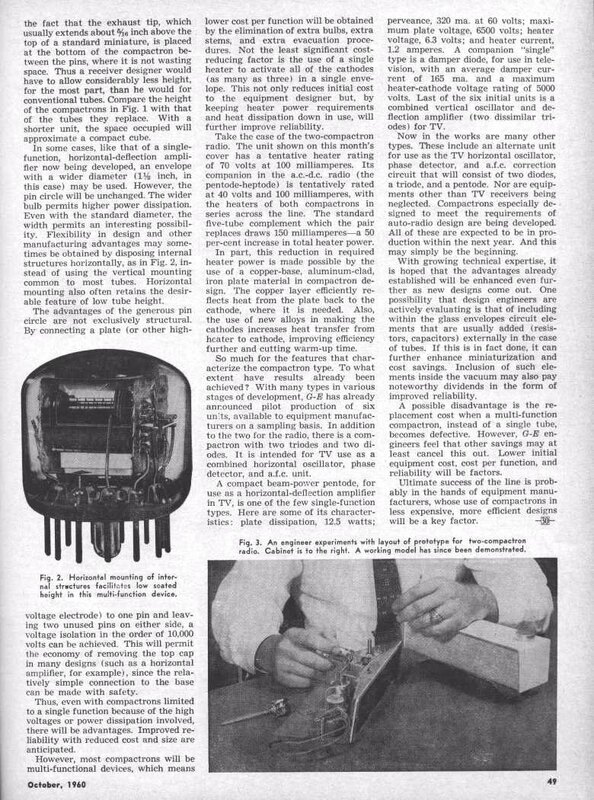 GE was going to make a pair of compactron tubes for AM tube radios. One tube would be the front end pentagrid converter and the IF pentode stage (maybe 40B11), the other the detector diode, audio driver, andio output and the rectifier (maybe 70C11). If you do not wish to mess with the RF and IF stages of the radio, here is still an interesting mod you can perform. 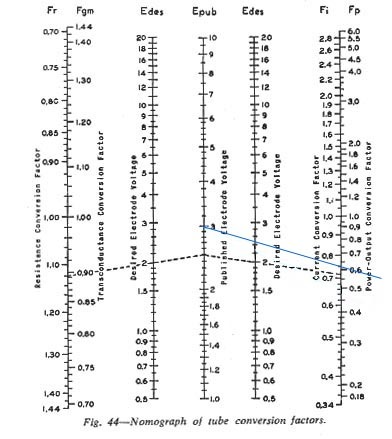 All you need do in the RF and IF is change the 12BE6 and 12BA6 to 6BE6 and 6BA6 respectively, and that should require no alignment adjustments at all. Here are the interesting parts: Remove the 50C5 and 35W4 sockets from the circuit board (helps if you choose a radio where these are next to each other). Carefully bending the leads on a 12 pin compactron socket, try to connect the appropriate pins to the appropriate circuit board socket holes. You'll need a few wire jumpers for sure. Replace the 50C5 cathode resistor with a 300 ohm 1 watt resistor. This will create plate current of about 50 ma, which is about that of the 50C5. The 53HK7 cathode likes to operate at about 15V, instead of 7V with the 50C5. The supply voltage will be a bit higher with the 53HK7 than with the 35W4. This will mean that the original audio output transformer can be used in this modified radio. 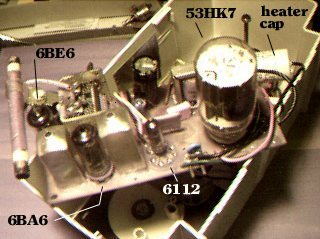 The 53HK7 isn't being worked as hard as it could be, as the output transformer is loading it at 2500 ohms impedance, instead of 1200 ohms in the 3 tube compactron radio described at the top of this page. Also, in series with either the cathode or plate of the 53HK7 tube's diode section, use a resistor of about 18 ohms. This limits peak power supply capacitor charging current to a value the tube diode can handle. Generally, tube diodes can only take a max peak current about 5 times average current. You can temporarily use a 6AV6 in place of the 12AV6 to test the 53HK7 mod. Assuming success, you can remove the now 6AV6 socket (and tube!) and solder in a subminiature 6112 twin triode tube. One section is the first audio driver stage, the other section will be the detector. 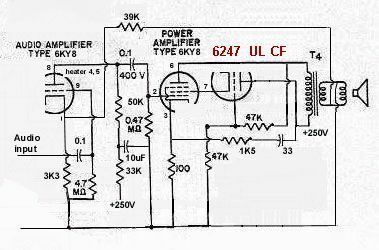 Use a 22K resistor in the cathode of the driver triode, for less distortion in the audio. You can do this now that the detector cathode is separate from the audio driver cathode. The detector section has its cathode tied to ground, and the IF signal feeds into the grid. The plate is grounded, which thus forms a shield. The section of the heater that serves the detector section should be tied to ground for less hum pickup. This is the ground end of the series heater string. Data sheet for the 6112. Here the heater current is 300 ma. The 53HK7 is rated at 315ma, but is happy with 300ma. A series AC capacitor of 8uF is called for here. Same sort of calculations to determine this series heater capacitor. Here are two radios, an AM and an AM/FM, with about 300VDC B+ on the audio output stage. As the 38HK7 is intended to be a horizontal output tube, it can take higher voltage on the plate. It's rated for 500V. Also an audio output transformer salvaged from a 6V6 amp is used here; it has an impedance of 5K. This results in higher power than that of the 50C5 amp. The audio coupling caps were increased for more bass. And the speaker was replaced with a modern one intended for cars, for more power handling. To produce the higher B+, this radio is run directly from a 250VAC powerline (mains). The damper diode of the 38HK7 is used as the rectifier. It is rated at 3700V PIV, which is way more than that needed here. A 9K dropping resistor is used to reduce the B+ to 120VDC for the screen grid, and then thru another 1K resistor for the rest of the set. The heater supply is fed via a dropping capacitor. The front end tubes are 4BE6, 4BA6 and 4AV6, selected to have the same heater current as the 38HK7 but otherwise the same as the original tubes respectively. As 4BA6's are a little hard to find, one could use a 4BZ6, 5JL6 or a similar TV IF tube instead; but the cathode and G3 pins are swapped, and it may need shielding. Or use a 6HR6, as its heater is 450ma, and the cathode and G3 pins match those of a 4BA6. The 6HR6 has more gain then the 4BA6, too. Less suitable would be sharp cutoff pentodes like the 4AU6, as strong stations may distort. Another possibility is to use 300ma heater tubes, such as the 58HE7, or 53HK7 (315ma, but will work in a 300ma string), 6BE6, 6BA6 and 6AV6. And another possibility is to modify the set to accept tubes like 11AR11 and 8B10, as described at the top of this page. Data for 4BZ6, 4BA6, and 4BE6. The audio driver triode (4AV6) needs to develop more voltage amplitude to drive the 38HK7 to the full power output available from its 300VDC supply. This can be easily done by connecting the 4AV6 triode plate resistor to the 300VDC supply (thru a 30K and 0.1uf hum filter) rather than the 120VDC supply. More details on modifying radios for use on 250V mains can be seen here. Here the 38HK7 is a bit too close to the plastic radio cabinet. Heat radiation melted the plastic a little, even though the plastic was below the tube. Best to keep this tube 2 or more inches away from plastic. Manufacturers sometimes use foil as heat shielding for plastic. This sort of thing is why I don't do mods in valuable or rare radios! 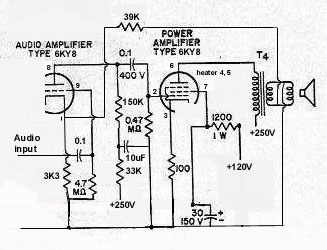 A similar 240VAC mod with 300VDC B+ on a 38HK7 was done to an RCA 3RC76 AM/FM set. The original 150ma heater tubes were changed to those with 450ma heaters. Except for the FM front end 17C9, there a 6C9 (which draws 400ma heater current) was used. A 120 ohm resistor in parallel makes up the missing 50ma. 4BZ6's replaced the 12BA6's in the IF, only thing the screen grid and cathode pins are swapped, so minor rewiring is needed. 4BZ6's need tube shields, as there is no internal shield like 12BA6's have. Shields improve stability. You can make a shield by wrapping thin solderable metal around the midpoint of the body of the tube, and grounding it with a stiff wire that will hold it in place on the tube. You could use 6HR6's to avoid this. A 4AU6 final FM IF replaces the 12AU6, easy. 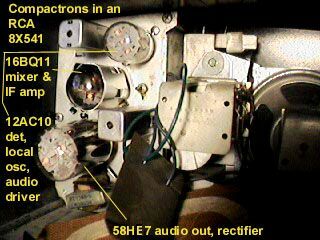 The 14GT8 FM detector/ first audio needed a 6FM8 to replace it, same pinout and similar specs. A minor tweak of the ratio detector is all the alignment done to this set. And a 4BE6 replaces the 12BE6 for the AM front end, again easy. Many TV tubes were put to work in this mod! More mods other than the heaters: The audio driver triode (6MF8) needs to develop more voltage amplitude to drive the 38HK7 to the full power output available from its 300VDC supply. This can be easily done by connecting the 6FM8 triode plate resistor to the 300VDC supply (thru a 30K and 0.1uf hum filter) rather than the 120VDC supply. Also inserted a 4. 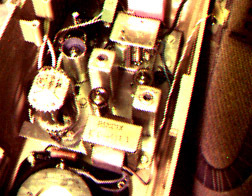 7K cathode resistor bypassed to ground on this triode. Doing this yields about twice the drive audio voltage. Added half megohm resistors to draw idling current from the unused AM tube (4BE6) while the radio is in FM mode. This helps keep the cathode from suffering poisoning if no current is drawn. Same thing for the FM tubes when in AM mode. Also to help RF/IF B+ supply regulation, a 47K power resistor was added to the AM B+ to draw the missing current the FM circuits would draw in FM mode. This helps maintain reasonably similar voltage (130V) on the 38HK7 screen grid. This voltage supply is dropped from the 300V B+ thru a 7. 5K power resistor. Thus the need for a reasonably unchanged load when in AM or FM mode. This AM/FM set draws about 60 watts from the 250VAC line. Here we are using a compactron tube meant for use as a TV set vertical oscillator and output. As seen in both curves, the 6KY8 triode and the pentode sections are both sharp cutoff. Suitable for audio amp work. The power supply B+ available is 250VDC. The pentode load can be figured by drawing a diagonal line from the zero control grid volts curve (about 50V and 175 ma plate current). The line goes from there to 250V and 10 ma plate current. The load resistance would work out to be 1200 ohms. Output power would work out to be about 1 watt. A variation on the above would be to make it an ultralinear amp. Usually the output transformer has a tap for the purpose located at about 43% voltage of the plate lead. 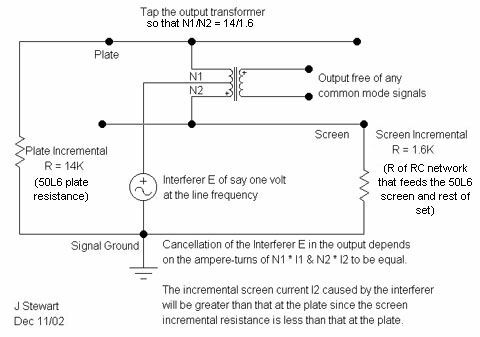 If the transformer you are using has no such tap, one could fake it by doing a voltage divider off the plate and using a cathode follower to make it a low impedance. The screen grid is meant to be used as an input here. But it will collect a small portion of the electrons normally headed for the plate, and that current would load down a high impedance circuit like an unbypassed screen resistor. You would get an undesired feedback loop in that when the screen voltage goes down, plate current drops, which in turn will cause the screen to attract more electrons. The waveform on the screen starts looking rather non linear. As a side benefit for this amp, the voltage divider also produces the lower screen voltage this tube wants. 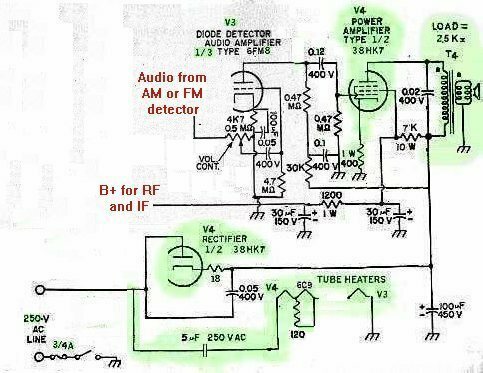 A method of bucking hum and other power supply noise: To avoid hum from getting to the speaker, one could add more filtering in the power supply. Another way is to cause the output tube to produce the same amount of noise on the plate lead of the output transformer as there is on the B+ lead. The output transformer thus will not "see" this noise and not send any to the speaker. If the output tube had an infinite plate resistance, it would act like a perfect current source and not create a voltage division of the power supply noise and hum across the output transformer. The 6KY8 has a plate resistance of 18K, but that is in pentode mode and the plate at 130V. With the B+ at 250V and in UL mode, it will be lower. Measurements imply that it is around 2.2K, and the gm is around 8000 umhos. The output transformer impedance is around 2.2K, so this creates a voltage divider of say 2.2K and 2.2K ohms. That produces about 50% of the power supply noise and hum across the output transformer primary. Now if we make the output tube produce a waveform to make up for that 50%, the output transformer will see no power supply noise and hum across its primary. And thus no noise and hum delivered to the speaker. We can do that by injecting a small portion of the power supply noise and hum to the output tube's cathode. A cap and resistor from B+ to the cathode will do that. The output tube would look like a grounded grid amp with respect to this. The gain of the tube and the above voltage divider will determine how much hum and noise you need to feed into the cathode. Here the cathode resistor (100 ohms) with the just mentioned cap and resistor will make a voltage divider. Also the tube acts like a cathode follower, with an impedance something like 200 ohms. Or it can be described as a grounded grid amp with an input impedance of 200 ohms. I used a 33uF cap (80 ohms @ 60Hz) (I use 60Hz as my power supply is a voltage doubler) and a 1.5K resistor to the cathode from B+. That's a big cap but I wanted to keep phase errors down. This feeds into what looks like 66 ohms at the cathode node. With the gain of the output stage about 10 (but as the cathode is not bypassed, the gain as seen by the control grid is around 5 due to cathode feedback), and our needing to make up 50% of the hum and noise, we only need 5% of the hum and noise on the cathode. The just mentioned resistor and cap, combined with the cathode resistor, will produce about 5%. Thus the B+ hum and noise is canceled out as heard at the speaker. In an AA5, try 1uF and 18K. How about some solid state work now? There were hot chassis solid state sets made, GE made many in the early 1970's. These used a high voltage transistor Q1 for the audio output, and the power supply for the RF and IF sections was obtained from the output transistor emitter. Using a junked computer monitor as a source of parts (junk box), I changed Q1 to one that was used as a horizontal output (higher collector voltage rating) and added more heatsink to the existing one and used some "goosegrease" (heat sink compound), D2 to one rated for 1KV PIV, increased the D2 series resistor R2 from 300 ohms to about 450, C1 from 150VDC rating to 400VDC, and R1 to a resistance from 7.5K to 12K, as B+ went from 100VDC to 200VDC. C2 was changed as the old one was rated for 15V, and I expected the voltage here to slightly exceed that. The base and emitter voltages on Q1 changed slightly, from around 6V to 7V on the emitter. That's mainly due to a slight error on resizing R1, but it's not that significant. A one amp fuse in series with the entire set would be a good idea, in case something blows.